PESHAWAR: Police and civil administration kept waiting at the Pak-Afghan border at Torkham on Tuesday night to receive from Afghanistan the body of a police officer who was kidnapped in Islamabad last month. 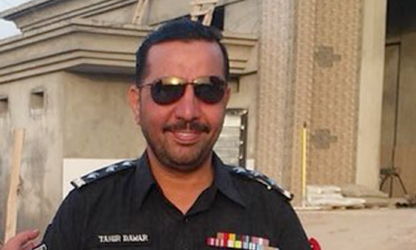 SP Tahir Khan Dawar, the head of Peshawar police’s rural circle, was kidnapped from G-10/4 area of the federal capital on Oct 26. On Tuesday, a body said to be of the officer was found in Nangarhar province of Afghanistan. Officials say the military authorities were in contact with their Afghan counterparts to facilitate the transportation of the body, but it was not likely to reach here on Tuesday. “We may get the body tomorrow,” a senior official said. The photos of a badly tortured body of the SP and a hand-written Pashto letter, purportedly written by a yet unidentified militant group, went viral before police could officially confirm the happening, but a senior official said a “source” had informed them about the tragic news. On Tuesday, pictures of the body with a letter written in Pashto placed on the chest were shared on social media. After the post started to circulate on social media, KP police refused to confirm it, saying it was not possible for them to verify the reports. However, a senior government official told Dawn that the police had been informed that the SP’s body was being brought to Khyber district via Torkham border crossing. The official said that the deputy commissioner of Peshawar and the SSP operations were on their way to Torkham border crossing to receive the body. A senior KP police official told Dawn that a source alerted them about the discovery of the body inside Nangarhar province of Afghanistan and it was later followed by the appearance of the pictures on social media. The official said that Islamabad police had shared nothing with KP police about the investigation. He said that KP police and local administration officials were there at the Torkham crossing to coordinate with Afghan authorities to receive the body. The official said that there was no indication or information about the kidnapping of SP Dawar and that he had been shifted to the other side of the border. He said that they would investigate where the officer was exactly killed in Afghanistan and which group was responsible for his murder. The official said that the paper found on the body mentioned no militant outfit and they would also investigate it later. Meanwhile, Ahmaeduddin, a brother of SP Dawar, told reporters at his residence in the phase-VI area of the Hayatabad that they had yet to receive any official confirmation of his death. A large number of people were turning up to sympathise with the family after the news of his death spread on social media. The pictures shared on social media showed the body of a man clad in a pair of black trousers and a maroon shirt with a crumpled piece of paper on the chest. The bloodied face and arms showed that the victim had been tortured to death. The note written in the Pashto language carries the name of the Wilayat Khorasan, the nomenclature the Islamic State (IS) militant organisation uses to refer to the Pak-Afghan region. It refers to SP Dawar with his first name and said that the “cop who had arrested and killed several militants has met his fate”. The note also warns other people to take caution and threatens that otherwise they would also meet the same fate. Mr Dawar had travelled to Islamabad from Peshawar on Oct 26 only to disappear on the fateful day. His family told Islamabad police that the officer’s phone went off at around 7:45pm. Mr Dawar hailed from North Waziristan district and earlier this year was made acting SP and given charge of rural circle. Prior to that he had served as DSP of University Town and Fakirabad and had also had a stint with the Federal Investigation Agency. SP Dawar had also survived two suicide attacks while he was posted in Bannu district.